As I'm preparing for an upcoming workshop--and my own teaching next week--I decided to finally wrestle this lesson into an easy-to-implement product. Using the text "Learn about Light", students will sort ideas, figure out what's important, and write a summary. As I wrote last year, this is the best way that I've found to help students dive into a text to find the important ideas. I've posted the lesson here. Feel free to download it and see how it works with your students! I'm curious to see if it will go differently with January fourth graders as opposed to May fourth graders. We've been talking about text features in my classroom--what they are, how to use them, and why they are important. But I knew that I needed to address how we read nonfiction after a quick conversation with a student. He was returning a book about muscles. "Did you like it?" I asked, my standard question as kids plunder the shelves for new books. "Yeah," he said. "It showed me how muscles work, and that was what I wanted to know." He was quiet for a second, and then added, almost apologetically, "But I didn't read the whole thing. I just looked at this page, and read the caption, and that was what would help me with the project I'm doing." He looked at me as if he was worried that I might make him take back the book. "But that's what we do in nonfiction," I told him. "You don't have to read every page. You find what you want, and read that." "Oh," he said, as if I'd said something new and interesting. Had I? As I thought about the conversation, I decided that I needed to address this issue. Of course this is dangerous! State testing is coming up in April. Do I want my students to think that they don't need to read everything on the test? Do I want them to skip through? On the other hand, what will help them out in real life? An unreasonable expectation that they read every page of every book, or an understanding of how to use text features to find what they want? These kids are smart--they'll figure out sooner or later that they don't have to read every word of every text to figure out the answers. If I insist that they do so, it will cast everything that I've told them into doubt. I decided to bring this issue out into the open and trust in the students. First, we had a silent debate. I put a queen puppet under the document camera (super cool!) and told the students: "The Queen wants to learn about the parts of a barge. She has found this book, A Guide to Boats of the Eastern Coast. Does she need to read the whole thing?" In a silent debate, students write their reasons on one sheet of paper that they pass back and forth. I assigned students to either "yes" or "no". They were upset that they couldn't choose, but I told them, "It's important to think about both sides of an issue!" As I expected, the debate was lively. Students on the "yes" side said that information about barges might be scattered throughout the book. Students on the "no" side said that she could use the Table of Contents and index to find what she needed. After the debate, we talked about their thinking. Both sides had valid arguments. "Are you ready for the real answer?" I told students. "Do you want to know whether the queen really has to read the whole book?" "Well...." I drew it out. "It depends." What a cheat of an answer! But it's the truth. Whether or not you have to read the whole text depends on many factors--like your purpose for reading, your background knowledge of the topic, even the amount of time that you have. A reader needs to be flexible and ready to make an informed decision. Over the next few days, I gave them the chance to try it out. In the computer lab, they tried several sessions on Study Island. This was great because they could see immediately if they'd gotten the question correct or not. They found that there were some kinds of questions that they could answer without reading the whole text (headings questions, especially) and other questions that they needed to read the whole text to answer. The next day, we looked at a piece about the Columbian Exposition. After we looked at the headings, the students' eyes grew wide. This was a very different kind of text. Could they just answer the questions? We read over them and found that there were two (a vocabulary question, and a text features question) that could be read without an understanding of the text. But a question like "Which is an effect of the Columbian Exposition?" was a different story! "Um, yeah, I think I'm going to have to read this whole thing," one student said. And he'd been the most vocal proponent for skipping the text earlier in the week. So far, my gamble looks like it is paying off. Kids are thinking about their purposes, and making intelligent decisions about when to read the whole text, and when to just jump in and find the answers that they seek. And the student who started it all--the student who had read parts of the muscle book--had the very best reason of all on the silent debate. "The Queen doesn't have to read it all, because Mrs. Kissner says we don't have to read it all. Beat that!" We're talking about text features! Today we started out by examining the word feature. I've noticed that students already know the term "text feature", but they tend to say it really fast, as all one word--textfeature. But the word "feature" is a high utility word, one they will be able to use across disciplines and situations. I used a simplified definition for students, telling them that a feature is "a part that gets your attention." They did have experiences with the word, and we talked about a DVD's special features, their facial features, and a car's features. Next came the fun part. I have two sons, so I have acquired a large quantity of Playmobil toys. I brought in five different boats. "These boats all have different features," I told students. Then, they got into small groups to examine the boats and label the features with notecards. The purpose here was twofold. I wanted students to practice looking closely at an object and analyzing the parts. I also wanted to look at how the different boats had different features. The fireboat, for example, has a hose, while the airboat has a fan. It was so successful! Students were highly engaged in looking at the features, and they shared their knowledge. "I know a lot about boats, and this is a galley," one student told the others. Many of the students were familiar with a winch, but struggled with what to call the steering mechanism. Wheel? Joystick? Steering wheel? I just loved the conversation, because it really flowed from our work with paraphrasing. Students were working to name a concept and tossing out various words, judging them, and reshaping them. Of course, I can't just teach about the features of boats. We had to apply this to text. "Just like the feature on a boat is something that gets your attention, something that makes it interesting, a text feature is something that gets your attention in text." I had prepared envelopes with text features written on small cards. In new groups, students looked at high interest magazines and tried to match the cards to text features in the texts. "I don't know much about text features," one boy sighed. "I don't read those kinds of books." He stared down at the page of Kids Discover. "Are there any text features there?" "Well, think about what you did with the boats," I coached. "You looked to see what got your attention. What gets your attention there?" He looked down at the page. "An eel." "Is an eel a text feature?" I asked, trying to get him to move beyond the image on the page to the name for the image. "Well, I guess it's a picture," he said grudgingly, going to his envelope. "So that's a text feature?" We had a great time with the text features, and students were more eager to learn about them than ever before. Starting out with the real, concrete features of the boats made everyone relaxed and interested. If you don't happen to have a fleet of plastic boats at home, this works just as well with other objects. A collection of coats would work, or holiday decorations, or really anything with lots of neat little parts. It's January, time for my students to move on to working on personal narratives. One problem that I've had when we work on personal narratives is that students fall into a dull, humdrum travelogue: "I went to Hershey Park. I rode on the Comet. It was fun. I rode on the Great Bear. It was fun." Ugh. So I wondered--how can I help students to see the real value of the personal narrative? How can we take it beyond just a sequence of events and into a story that conveys a theme? And then I thought about it from the student's perspective. We're just moving from working on informational essays. Am I really ready to stand in front of everyone and talk about my deep emotions? Am I ready to reflect on deep experiences and share them with an audience? No! In fact, if I were called on to write about a personal experience, I'd probably fall back on a theme park story too--it's safe and easy. 2. I used an old trick for the mind maps. One at a time, students came up to the overhead screen. On a large piece of construction paper, I traced their silhouettes, as outlined against the screen by the overhead projector. Now, this step isn't necessary, and kids could just as easily have drawn a heart or a face themselves. But the silhouettes did add a "wow" factor! 3. Students worked to either write or draw pictures to show the people, places, or animals that are important to them. I didn't give them much direction, as I wanted to see what they would do. Some spontaneously wrote long explanations about why the people were important; others wrote about dogs and cats they had loved and lost; still others wrote about the people they see every day. 4. We reread My Great-Aunt Arizona from a writer's perspective. This time, we were looking for how Gloria Houston used repetitive phrases and ideas, and why she might have chosen to do this. By the end of the book, students were reciting along with the book: "With her long full dresses/and a pretty white apron/High buttoned shoes/and many petticoats, too". They did understand that the author repeated these phrases that she wanted us to remember, and that these helped us to understand more about what Arizona was like. 5. We collected all of the things that we noticed about the author's style on a chart: "We can write like Gloria Houston!" Students mentioned the repetition, the way that she organized the ideas as a story, and the way that she used concrete details to tell us about what Arizona was like. 6. By Friday, students were starting to brainstorm ideas about one person from their mind maps. Next week, we'll expand on these and look at how we want to write them. I've learned so much about my students as they have worked on this activity...what students like, who is important in their lives, and how they approach writing about themselves. All of these details will only help me to support them as we venture into writing personal narratives in the weeks to come. Upon our return from the break, I've been teaching paraphrasing. Of course, in fourth grade, paraphrasing has a very different meaning from what high school teachers hope to see. Not quite ready for locating and citing sources, we talk over and over about how paraphrasing means putting ideas into your own words. Pictures were a great way for us to begin. We looked at a picture, read a sentence that described the picture, and then tried to write our own sentences to show the same idea in different words. Dark clouds filled the sky. As students worked with a partner to try to paraphrase the sentence, I heard some great conversations. "What's another word for dark?" one asked. "Mrs. Kissner, could we use 'de-exposed' instead of filled?" The room filled with talk about which words could be replaced, and which words needed to stay the same. One student said, "We could call them 'puffy white things in the sky', but that would just be too many words. I think we should keep the word 'clouds'." In the field, the horses grew nervous and restless at the coming storm. Of course, to a skilled adult, the phrase "in the field" is a perfect candidate for moving around. "The approaching storm made the horses in the field skittish" or something along those lines would be fine. But my fourth graders kept on wanting to begin with "In the ....", and trying to replace "field" with "meadow". Which isn't bad--I'm glad that they know what a meadow is! But understanding how to move ideas around in a sentence is really a key to strong paraphrasing, and my students just aren't there. I thought that some cross-genre paraphrasing would help them to break free of this pattern. With new partners, students tried to paraphrase a nursery rhyme. I modeled this by showing students how to visualize what is described in the nursery rhyme, and then describe their mental images. (We used "Little Boy Blue", which worked pretty well. Narrative nursery rhymes work best for this--the ones that tell stories instead of just repeating lots of lines.) Even as students tried to move across genres, they still stuck with the structure of the original. "It's really raining, the old man was snoozing..."
So we will keep going. 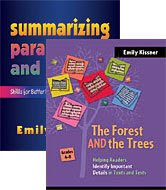 Reading several books on the same topic is a slow but powerful way to help students see how the same ideas are expressed in different ways. We just read three books about puffins, and are now starting several about turtles. One Tiny Turtle by Nicola Davies worked wonderfully...her text is a lovely description of a sea turtle's life, and students found it easy to paraphrase ideas from several pages. Wow! We have a long way to go. For now, though, we'll keep trying to find synonyms and looking for ways to rearrange ideas. It's hard to do, it's hard to teach. But paraphrasing is so important for our young readers. When students can put ideas into their own words, they can take notes, effectively answer questions, and summarize. Today we embarked on a study of paraphrasing, preparation for future summarizing. And it was a tough go. Paraphrasing seems concrete, but is really a very abstract concept. Think about it--when we paraphrase, we take ideas and put them into our own words. So ideas exist outside of words. This is pretty abstract for fourth graders. (Just today, one of them asked me if The Sorcerer's Apprentice was a true story. Sigh.) They equate words with ideas--the words that are used to explain an idea ARE that idea. The challenge for teachers, then, is to help students recognize that ideas can exist without words. So I went back to visualizing. As we read original sentences, I encouraged students to visualize what the sentence was saying. Then, I had them keep the visual image, and try to write a new sentence to describe it. Results were mixed. For some students, this strategy worked brilliantly, and they wrote really decent paraphrased versions of the sentence. But other students struggled with the need to come up with synonyms, or the need to rearrange the order of ideas. By the end of the class, everyone at least knew that paraphrasing is putting ideas into your own words...which was a start. Tomorrow, I want to try again, with more concrete, easily visualized sentences. The next step, then, is to take paraphrasing into authentic texts. Here's a link to a Powerpoint that I made to use with students. Lots of snow pictures from Caledonia State Park!